Gary Bruce Williams was born March 4, 1945 in Collingswood. Clever and athletic, he excelled in a wide range of sports, including soccer, but found his home as a point guard for the Collingswood High Panther. When Gary attended the school in the early 1960s its most famous alumnae were Bonanza star Michael Landon and major league pitcher Ray Narleski. Gary played college ball for Bud Millikan at the University of Maryland, and was named team captain as a senior in 1966–67. The Terps’ best season was Gary’s junior campaign, when they went 18–8 and tied for second in the ACC. During his time on the varsity, Gary set a school record with a perfect 8-for-8 shooting night. Gary returned home after college to coach basketball. His first job was at Woodrow Wilson High in Camden. In 1969–70, Wilson beat East Orange High for the state championship. Two years later, Gary took an assistant job at Lafayette, which eventually led to his first college head coaching assignment, in 1978–79, at American University. For the rest of his career, he would teach his players the aggressive man-to-man defense he learned from Millikan. He also perfected the half-court trap, which he learned at Lafayette. Gary went on to coaching success at Boston College and Ohio State during the 1980s, and then accepted the head job at his alma mater, Maryland in 1989–90. His timing couldn’t have been worse. The NCAA uncovered multiple violations that predated his arrival, but hit the Terps with sanctions that hamstrung Gary’s recruiting efforts for nearly five years. 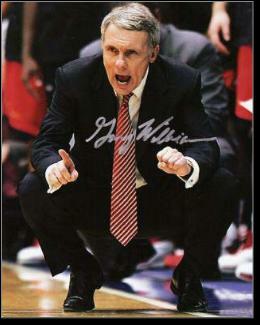 By the mid-1990s, Maryland had returned to respectability and Gary was being hailed as one of the nation’s top coaches. The school received an NCAA Tournament bid every year from 1994 to 2004. In 2001, the Terps advanced to the Final Four, losing to Duke. However, one year later, Maryland won 32 games and captured its first ACC title since the 1970s. The team—led by Lonny Baxter, Juan Dixon, Chris Wilcox and Steve Blake—rolled all the way to the national championship, defeating Indiana in the title game. Gary led Maryland to the ACC Tournament championship in 2004 and a regular-season title in 2010. That season, he won his second ACC Coach of the Year Award. He retired from coaching following the 2010–11 season, staying with the university as an athletic administrator. He left the game as Maryland’s all-time leader in wins, and third in ACC history behind Dean Smith and Mike Krzyzewski. Among the NBA stars who played for Williams as collegians are Dana Barros, Joe Smith, Waly Williams and Steve Francis. In 2014, Gary was enshrined in both the College Basketball Hall of Fame and the Basketball Hall of Fame.